Camel Safari is one of the signature experiences of Rajasthan since time immemorial. It is often seen that a trip to Rajasthan seems incomplete without a safari. 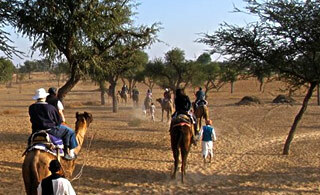 Camel Safari tour completes this rich experience of royal Rajasthan in the most admired way. During this tour, there are immense opportunities to enjoy the camel ride in destinations like Mandawa, Bikaner, Jaisalmer and Jodhpur. On arrival in Delhi, meet Incredible India tour representative at the Airport for assisted transfer to the hotel. Afternoon proceed for half day sightseeing of New Delhi. Visit India Gate, Qutab Minar, Humayun's Tomb and drive past the President House. Overnight stay at the hotel. Morning drive to Mandawa. Arrive Mandawa and check - in at hotel. From this hotel you can take a walking tour of the town which is renowned worldwide as the picture book for its colourful wall illustrations outside the merchant homes. Overnight in Mandawa. Morning drive to Bikaner. Arrive Bikaner and check – in at hotel. Here, the camels are bred in the Asia’s only Camel Research and Breeding Farm. Visit the farm and see the camels in their habitats. Also visit the Junagarh Fort, built by Rai Singh between 1588 and 1593, has a 986-metre-long wall with 37 bastions. Also visit the government-managed Camel Research and Breeding Farm is only one of its kinds in Asia. Morning drive to Jaisalmer, the golden hued desert city famous for its Sonar Qila, Jaisalmer Fort. Check – in at hotel. This is the second halt in desert topography of Rajasthan. The location is favourably developed to offer tourists a rich desert experience. Also from here, there are special track routes that offer unique camel safaris. Return to the hotel for overnight stay. Morning start Camel Safari for Badabagh, the site of royal cenotaphs of Bhatti Rajput Kings in Jaisalmer. Also visit Baisakhai, a typical Rajasthani village. Return to the tent for overnight. Morning proceed for Lodharva via Roopsi, a mixed cast village near Jodhpur. Enjoy the rustic charm of a village near Jodhpur. vernight in tent. Morning proceed for Jaisalmer via Moolsagar and Amarsagar. Upon arrival, check – in at hotel. Stroll along the colourful bazaars of Jaisalmer. Jaisalmer sightseeing includes a visit to Jaisalmer Fort and Gadisar Tank. Overnight at hotel. Morning drive to Jodhpur. Arrive Jodhpur and check – in at hotel. Morning drive to Jaipur. 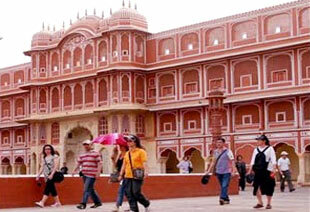 Arrive Jaipur and check – in at hotel. Morning drive to International airport in Delhi to board flight for onward destination. Tour ends.